Want to learn more of Martha's story? Judea. The early decades of the first century AD. As the power of the Roman Empire stretches across vast swathes of the known world, a young Jewish girl grows up within a devout family, learning her nation's customs and faith. But her seemingly ordinary story will soon intersect with the events that will change history forever. As Martha's world is rocked by circumstances that leave her questioning the God in whom her forefathers put their trust, she slowly learns to wait and to watch for the One whose coming has been foretold by the prophets-the Messiah, who will right all wrongs and establish God's kingdom. But when Martha and her siblings begin to encounter a radical new preacher from the north, their long-cherished dreams are first challenged-and then shattered. Can this extraordinary man - Jesus - really be the Messiah? 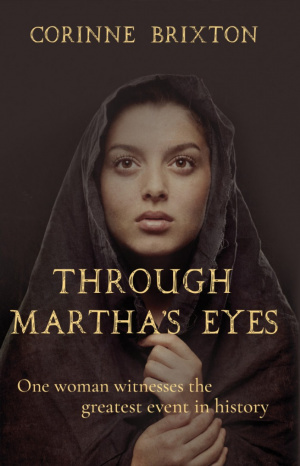 Using an imagined back-story for one of the characters recorded in the gospels, "Through Martha's Eyes" provides the reader with the cultural and historical background to understand more fully the story at the heart of human history. Its descriptions of places, people and customs in the pages of the New Testament seek to enrich and enlighten both those who are new to the Bible and those for whom it is an already-cherished treasure. Through Martha's Eyes by Corinne Brixton was published by Matador in January 2017 and is our 1541st best seller. The ISBN for Through Martha's Eyes is 9781788036283. Got a question? No problem! Just click here to ask us about Through Martha's Eyes. Revd. Dr. David Wenham, MA, PhD, Tutor in New Testament, Trinity College Bristol; author of "The Parables of Jesus", and "Paul and Jesus: The True Story"
Rt. Revd. Graham Tomlin, Bishop of Kensington and President of St Mellitus College; author of "The Seven Deadly Sins and How to Overcome Them", and "Looking Through The Cross"